But speaking of enemies, today’s episode has a great one. It’s the wonderful actor Peter Vaughan as a doomsayer-type preacher who is organizing a fake nuclear attack to cause a mass panic while his men heist banks and jewelry stores. Our son really hated this guy. He got so irritated with him that he had to break out his trusty finger-pistols to start shooting at the screen. He also got so worried about Georgie investigating the enemy headquarters that he hid under his blanket, peeked out just long enough to see that she was getting away, and then gasped in total shock when the camera revealed Vaughan, showing that she wasn’t so lucky! Isobel Black plays the villain’s daughter, and Talfryn Thomas has a tiny walk-on part. Thomas is only on screen during one of the filmed segments, and these are, again, completely beautiful. I’m always impressed by the restoration of black and white BBC material, but while the studio stuff looks very good – many of the same team worked on restoring Doctor Who – the film material looks like it was shot yesterday, with incredibly crisp blacks and resolution so fine you can marvel at the stonework on the old buildings in the London streets. There’s also a terrific scene shot at night where a man is surrounded by the doomsayer’s henchmen, each of whom is wearing one of those “The end is nigh!” sandwich-boards. There are probably people who saw this episode in 1966 and are certain it actually happened in an episode of The Avengers! But two little elements just can’t help but remind you that you’re watching television and not the real world. One problem is that the studio set doesn’t match the exterior of the villain’s Mission Hall. The window that Georgie peeks through is on the opposite side of the front door when they cut from film to the studio. And the other problem is that Georgie’s fab scooter – is it a Vespa? – lies parked outside the hall for something like two days and nobody makes off with it! Tonight’s very entertaining episode of Adam Adamant Lives!, written by Richard Harris, is mostly set around a ginormous country estate. The villains are blackmailers who hide behind a supposedly Satanic coven, promising their targets an evening of debauchery and disgraceful behavior. We paused to give our son a quick explanation of the postwar economic situation that hit the gentry and aristocracy with astonishingly high estate taxes and forced many lords to choose between selling their gigantic country homes or finding some way to make money from them. We also reminded him of Lord and Lady Collingford from the second series of Catweazle. Adam, knowing nothing of the tax issue, is shocked and appalled to find a stately old home that he had known from his previous life turned into a tourist attraction, with a zoo, carousels, an antique rail car ride (just like the Hanson Cars at Six Flags Over Georgia) and a Royal Navy helicopter. These scenes were filmed at Woburn Abbey, which had in reality also been converted into a tourist attraction by the 13th Duke of Bedford in the 1950s. 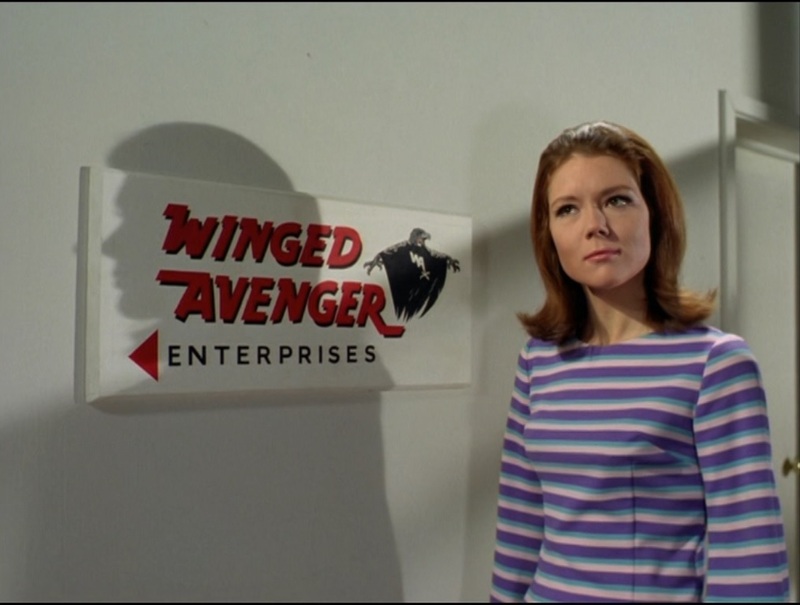 Nevertheless, I’m assuming that Great Britain’s economic situation had been totally reversed by 1966, because this is about the fifth time in eight episodes that Georgie Jones has been able to get a job, training, and a uniform in the time that it takes for Adam Adamant to have a glass of claret with the villain. I absolutely love the way that Adam does not play by TV hero nice guy rules. He disarms an opponent at one point in this story and then goes ahead and runs him through with his sword anyway for daring to pick the fight. None of this namby-pamby “oh, if I kill you, I’ll be no better than you” nonsense. Nobody else in 1966 was so delightfully ruthless! As we’ve now watched eight of the surviving seventeen episodes, we’ll take a short break from Adam Adamant Lives! and come back to it at the end of the year, to keep things fresh. We have several other great shows to finish up between now and then, so stick around and stay tuned for more! So there’s this absolutely perfect little shot right at the end of the first episode of Adam Adamant Lives!, and as we watched it tonight, I said to myself: “There! That’s the picture for tonight’s blog post!” As I do. Then I put the disk in my Region 2 external drive and watched it tell me I’d bought an Australian copy. So, as with The Secret Service and a small chunk of Thunderbirds are Go which we watched on my multi-region player before I bought a separate external drive for Region 2 disks, we’ll just have to make do with a pic of the DVD box. But then again, my history with Adam Adamant Lives! has long been one of the world’s different television formats conspiring to exasperate me. Back in the VHS tape trading days, I struggled through some incredibly ropey copies of the first six episodes, with tape hiss that was so incredibly loud that, until I actually bought this two years ago, I honestly thought that the party guests in the first scene were dancing to silence. The music in the scene is quiet, but the hiss was so loud it masked it completely. And yet it was worth the struggle to watch and listen, because the show is just so fun. Adam Adamant Lives! stars Gerald Harper as an incredibly famous and successful gentleman adventurer from the turn of the century. In 1902, he vanished on his final case, trying to track down a Moriarty-type foe called The Face. But Adam’s first encounter with the villain saw him betrayed by his lady love, and frozen in suspended animation, left in a block of ice for “eternity.” The world never learned what happened to Adam Adamant, until his frozen tomb was uncovered in 1966. Bizarrely, Adam’s icy resurrection is incredibly like the way that Jack Kirby and Stan Lee handled the return of Captain America in issue 4 of The Avengers, published a little over two years before this was made. Even more bizarrely, if you flash forward to the epilogue to 2011’s Captain America: The First Avenger, then it’s so much like Adam escaping from the hospital in 1966 that you’ll do the same double-take I did when I saw the movie seven years ago. Adam is dazed by the sights of Picadilly Circus, while it’s Times Square that stops Cap in his tracks, but they’re awfully similar. At least Steve Rogers had the advantage of knowing what an automobile is, mind. Adam is assisted by Georgie Jones, played by Juliet Harmer, a longtime fan of Adamant’s who lets him recuperate in her flat, much to our Victorian-era hero’s embarrassment at her social situation: dressing like a boy and allowing men to sleep overnight in her home. He doesn’t understand the slang of the present day, much like how people in the 25th Century don’t understand some of Buck Rogers’ patois. Adam Adamant Lives! was devised by Sydney Newman and produced by Verity Lambert, and the first episode was written by Tony Williamson, Richard Harris, and Donald Cotton. So there’s lots of behind-the-scenes talent from the worlds of Doctor Who and The Avengers, which is why so many fans of those programs eventually check this one out. Having some familiar faces from the UK’s deep bench of character actors active in the 1960s helps; Joby Blanshard is a police inspector with a single scene in this one. Our son wasn’t blown away or anything, but he liked it. The criminals in the first episode are a dreary trio running a common protection racket, nowhere as grandiose or weird as the show’s villains would become, and the story lingered a little too long on them for our son to be happy. They have the upper hand for far too long, basically, but these criminals don’t realize that Adam Adamant comes from a world where the villains die at the end of his sword stick, and he doesn’t wait around for Dixon of Dock Green to calmly make an arrest. The scenes of Adam staggering around mod London, weakened and semi-conscious, horrified by the noise and the lights and the – surely that sign doesn’t say “striptease” on a city street?! – prurient nightmare of the contemporary world are really effective, and our kid enjoyed that scene a lot. I marveled at just how great the restoration of this print is. You’ll have to take my word for it, but the film sequences look like they were made just yesterday. The studio stuff is, like a lot of programs its age, a little variable, but it’s so nice to see Adam Adamant Lives! as it was meant to be seen… and hear it as it was meant to be heard! Quick little recap: We subscribe to the heretical-but-factual breakdown of The Avengers into seven seasons. For this final run, we will use the UK broadcast order, omitting the installments that had already been shown in America. That said, I have to agree that the admittedly more sensible people who watch and write about the show in production order have one big advantage: the first episode that was made after “Look – (stop me if you’ve heard this one) But There Were These Two Fellers…” was not actually shown in either the US or the UK until very nearly the end of the run. It is called “My Wildest Dream” and it was literally shelved for an entire year in Britain. The mildly aggravating thing about that is “My Wildest Dream” was actually the first episode of the show directed by Robert Fuest, who I think is by leagues the most interesting visual stylist in a show just full of very good directors. This sort of messes up a goofball claim I’d made a time or ten, that “Game” was almost a statement of principles by a vibrant and stunning new director. That simply isn’t true. He wasn’t to know that his first effort would collect dust for a long time. Strangely, even though it was made sixth in this batch, “Game” looks and feels like it was planned as an almost modern season premiere. It’s a very entertaining, simple, and straightforward story full of familiar faces like Alex Scott, Anthony Newlands, and Peter Jeffrey, but it’s visually amazing. I love the sets and the giant props, and some of Fuest’s camera tricks are just wild. 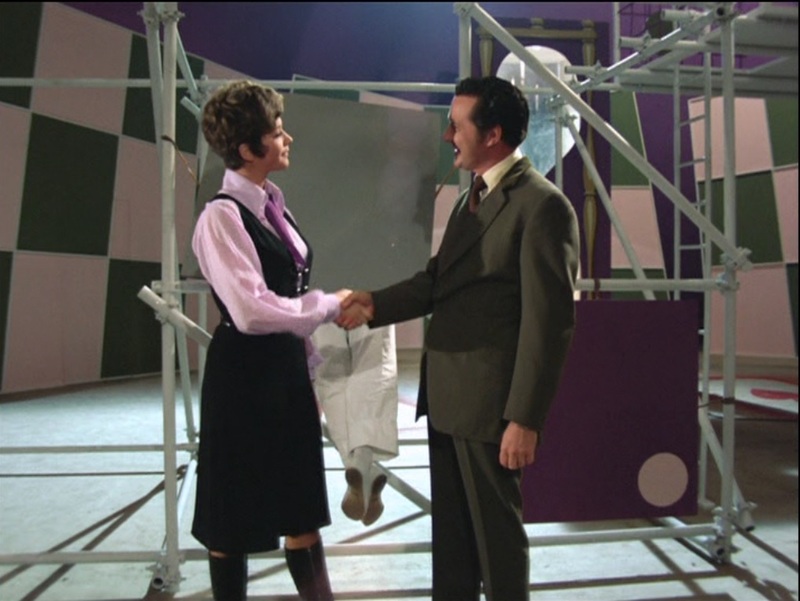 There’s one great shot in a playground where Steed and Tara discover the first of several bodies. They go to a swingset, and the cameraman is sitting on one swing and the actor playing the corpse is in the one next to him, and the swings are moving at different speeds. It takes my breath away every time. Our son really enjoyed this one, especially the fantastic fight at the climax. Anyway, I won’t say whether I thought my script was any good or not, but I learned a lot from the effort, and disappointed myself some time later when I realized it was pretty darn close to the first Mad Hatter story, “The Thirteenth Hat.” But here’s the weird coincidence: I stole from The Avengers twice as I was trying my hand at writing, and both of those episodes I robbed feature Garfield Morgan as one of the villains! A few weeks ago, I mentioned that the Batman show had a huge impact on popular media. It wasn’t just the rush of television series about superheroes, most of which were doomed to fail pretty quickly as the craze faded, but the influence of a bigger-than-life and often deliberate, camp, approach to action and adventure. American shows like Lost in Space, The Man From UNCLE, and Voyage to the Bottom of the Sea made the move from black and white to color pretty smoothly, but within a year, they were all getting really ridiculous, with unbelievable villains, deathtraps, monsters, and outrageous acting. The Avengers navigated the bombastic change with a lot more grace than the show’s American counterparts, but they still took the time during this larger-than-life period to parody Batman with this very silly and very fun story by writer Richard Harris about a comic book character – “superhero” doesn’t seem quite right – who has come to life. The Winged Avenger looks like Hawkman wearing a Captain Harlock costume and, while his creators squabble over whether it’s the writer or the artist who is the real genius, their creation stalks the night murdering ruthless businessmen. “Comic books” like we know them in America didn’t really exist in the UK at the time. Frank Bellamy, who provided the Winged Avenger illustrations, was at the time best known for painting the Thunderbirds strip in TV Century 21, but he’d worked on other large-format anthology “papers” like the Eagle and Look and Learn for more than a decade. There’s a clue in how the script refers to the character as the star of a “picture strip,” which was the typical term in the UK at the time, but the prop comics shown in the episode are American-style, with the Winged Avenger the star of his own 32-page book instead of appearing weekly as a two-page story. Also, the studio setup, with the creators hiring costumed models to pose for the art, is a lot more like what Frank Hampson pioneered for Dan Dare in the Eagle than any shoestring-budget American funnybook company in the sixties. And all this silliness ends with a very fun pop art climax that sees Steed walloping the Winged Avenger with great big panel boards that read POW! SPLAT! and BAM! Our son enjoyed this episode, and was repeating the costumed menace’s trademark line “Eee-URP!” whenever possible, but in the same way he somehow didn’t connect Wallace and Gromit’s launch sequence as a parody of Thunderbirds, he took this at face value and didn’t see it as a wink at Batman at all, just a great fight scene on its own accord. It’s so fascinating how he processes these things. 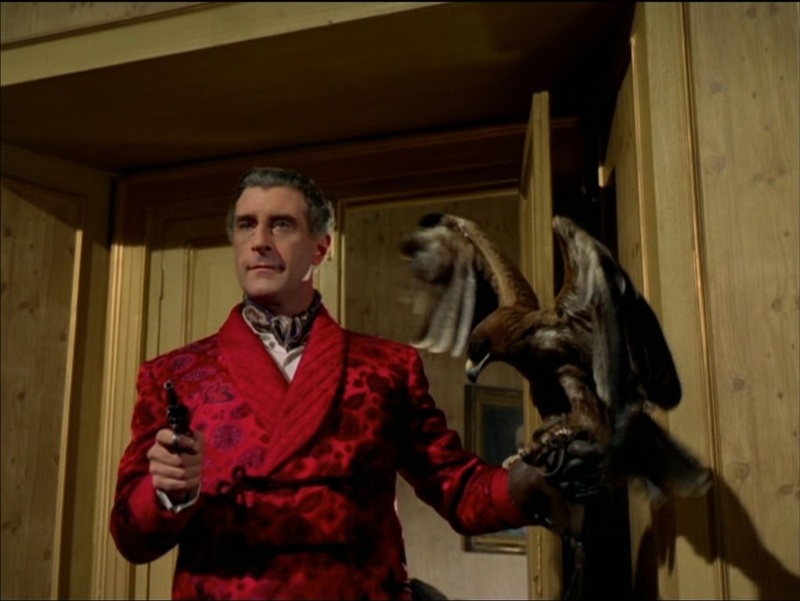 Anyway, here’s Nigel Green with a falcon and a gun. It turns out to not be really relevant to the story, but he looks fantastic with them, doesn’t he? Other familiar faces in the episode include Neil Hallett, Colin Jeavons, and Donald Pickering. Part of the episode was filmed at the absolutely beautiful Stanmore Hall near Birmingham. Some exteriors for “From Venus With Love” were shot here as well. It’s a mammoth, majestic building with incredible stone work, and then the studio interiors are so flimsy that the fake staircase that the actors climb wobbles like it’s made of cardboard!